“Several factors exacerbate hay fever,” says Julie Silver, author of Food Awakening: Nutrition for NOW (www.juliesilver.co.uk). “These include a weakened immune system, poor diet, dehydration, an overload of chemicals and toxins, plus stress. The liver has to cope with filtering chemicals. Any excess chemicals will make this more difficult and cause hay fever and allergies.” Julie recommends finding natural, healthy alternatives to wheat, dairy, sugar, alcohol and caffeine, as these may cause stress. She advises choosing gluten-free whole grains such as brown rice and millet, quinoa and buckwheat instead as they are more hydrating than processed and refined carbohydrates. She adds: “Vegan proteins such as beans, pulses, tempeh, nuts and seeds are less acidic and more hydrating than animal proteins.” Julie also recommends replacing black tea with rooibos/redbush tea as it is naturally caffeine-free and contains antioxidants. “Take natural supplements such as quercetin, vitamin C and bromelain to boost the immune system and prevent allergies,” she says. 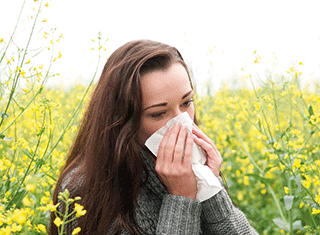 “There are an increasing number of natural remedies available for hay fever which have more and more evidence behind them to give you confidence that they can make a difference,” says airborne allergens expert, Max Wiseberg (haymax.biz). “Organic, drug-free allergen barrier balms have been shown to trap all sorts of airborne allergens, and in a study during the summer of 2014, 78 per cent of participants found they helped with some or all of their hay fever symptoms. So people have been able to use these and stop using the pharmaceutical treatments. “Many allergies, such as asthma or hay fever, are caused by pollen introduced into the respiratory system,” explains James Hamill, master beekeeper and head of development for HayfeGUARD® Local Honey (www.thehivehoneyshop.co.uk). James recommends that hay fever sufferers consume some raw, unpasteurised, local UK honey which has not been clear filtered as this process removes most of the pollen. He advises against supermarket honey as this generally tends to be heat-treated, which kills the pollen, and is often sourced from outside the UK. “If you suffer from hay fever in the UK then a particular plant here is producing pollen that is upsetting your body,” says James. The key is therefore to consume a honey that is local to your area to help desensitise the body to the pollen. “Start in the winter before the pollen season,” says James. “The longer you consume local pollen the better.” Eat it straight from the jar or on food, but don’t add it to hot drinks as this harms the pollen.